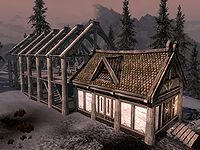 This page details the construction information for building any of the three homes added by the Hearthfire add-on: Heljarchen Hall, Lakeview Manor, and Windstad Manor. After you have purchased a plot of land from the steward of one of the three holds, you will be directed to travel to your new property. When you first arrive, you will find a drafting table, carpenter's workbench, anvil, chest, and log pile to aid you in construction. The chest contains thirty clay, one corundum ingot, six iron ingots, and thirty quarried stone, while the log pile contains twenty sawn logs. The provided materials are enough to build, but not furnish, the Small House. You can either purchase additional lumber from merchants at wood mills or cut it yourself if given permission from the mill owner, or give your steward gold to purchase it for you; the sawn logs used in construction do not show up in your inventory, appearing instead as a "Log Pile" on your property. If you own more than one property, the same log supply will be shared between them; and when you buy a new plot, if you already have sawn logs in your log pile, then those logs are not lost and you gain an additional twenty logs. Clay and quarried stone can be obtained by mining clay deposits and stone quarries (both of which provide an infinite supply); these are present near your home and throughout Skyrim. You must use iron ingots to craft hinges, iron fittings, nails, and combine them with corundum ingots to create locks at a forge or anvil. Glass, goat horns, and straw may be purchased from general goods merchants or Khajiit traders; goat horns can also be obtained by looting the bodies of goats. The visual design of each house is the same no matter where you choose to build, with each of the three houses requiring the same materials. The Small House contains basic living amenities, including a place to sleep and a chest for storage. The Main Hall provides furnishing options for the three crafting skills, so it is not necessary to choose a wing addition specifically for this purpose. All furnishing options for each room are in predefined locations and, with the exception of standard items which appear in your inventory, they cannot be moved. However, you may choose not to purchase or create certain furnishings in order to dictate your own style in each room, allowing a moderate level of flexibility in design. The Small House layout must be built before adding a Main Hall, and the Main Hall must be built before adding any additional wings. Each house can have a maximum of three additional wings added to a completed Main Hall, with three different options for each wing, allowing 27 different wing combinations. Six of the nine options for wing additions include an exterior rooftop area, either a patio or balcony depending on the addition. Small House: A small one-room house that comes furnished with one chest, with options to build a bed for sleeping, a firepit and cooking pot, one display case, and additional storage (seven usable containers). After completion, you may add exterior amenities detailed in the Exterior section below. These can be added at any time, whether you expand with further additions to your home or not. Main Hall: A much larger two-level building that is added on to the initial Small House. It contains two staircases, one on either side of the hall, leading up to the second level, with separate areas in the back on each level. You may add a large bed and two small beds, as well as an alchemy lab, an anvil, an arcane enchanter, a bookshelf with space for 54 books, a fireplace with cooking pot, a mannequin and two weapon plaques, and eight display cases. The Main Hall can include up to 66 usable containers for storage, excluding the Entryway and Cellar. After completion, you may remodel the original Small House room into an Entryway, add a Cellar, and construct additional wings on three sides of the home. Entryway: After building the Main Hall, you may choose to remodel the Small House room into an Entryway, with options to build two display cases, four single weapon racks, and eight usable containers. If you choose to remodel the original Small House into this area, then all improvements made to the house will be distributed throughout the rest of the house. Cellar: An optional addition to the Main Hall, which can include all Smithing facilities, an archery target and practice dummy, an armor mannequin, a set of five weapon racks, two weapon plaques, one display case, two mead barrels, an altar for holding your own personal shrines to the Divines, a coffin for sleeping (if a vampire), and 43 usable containers. Armory: Includes an exterior patio area on the roof. You can build five armor mannequins, two weapon plaques, two sets of four weapon racks, four display cases, two tanning racks, a workbench, a grindstone, and two archery targets. The armory can include up to 18 usable containers for storage. Kitchen: Includes a fireplace with cooking pot and the only available oven in the game for baking, as well as the only churn for providing butter. You can add up to 16 usable containers for storage. A number of food items are added along with other furnishing options. Library: A tower including a rooftop balcony area. You can build five tall bookshelves (each with four shelves that can hold eleven books each) and four smaller bookshelves (each with two shelves holding eleven books each) with storage for 308 books total. An additional eight usable containers can be added for storage. Trophy Room: Allows the display of three large and four small trophies. You can also add one display case and up to 16 usable containers for storage. Storage Room: Includes an exterior patio area on the roof. You can build three usable display cases, and add up to 46 usable containers for storage. Alchemy Laboratory: A tower including a rooftop balcony area. You can build an alchemy lab and up to 42 usable containers for storage. A number of food items and ingredients are added along with other furnishing options. Bedrooms: Includes an exterior patio area on the roof. You can add one double bed and two child beds, two display cases, and up to 18 usable containers for storage. Greenhouse: Allows for the planting and growing of certain plants indoors. You can build three large planters (four plants each) and six small planters (one plant each) with room for 18 plants total. You can add four display cases and up to 25 usable containers for storage. Enchanter's Tower: A tower including a rooftop balcony area. You can build an arcane enchanter, four soul gem braziers, two display cases, an armor mannequin, a weapon plaque, and a set of three weapon racks. You can add up to 13 usable containers for storage. The building of a homestead requires a lot of items just to construct the house and fully furnish it. If you need a complete list of all the total items required to build a fully furnished homestead, check out this table. Below is a more detailed breakdown of all the required materials per section of each homestead. You must begin your house by constructing the Small House. Select the plan from the drafting table, then proceed to the carpenter's workbench to construct each part. When you complete the house, you will have one chest for storage inside, even without adding any furnishings. The exterior additions to your home become available after completing the Small House layout. You do not need to choose a plan at the drafting table; just go straight to the carpenter's workbench. The locations of your exterior additions in relation to your house varies for each piece of property; details can be found on each individual house page. Unless otherwise noted, each addition adds the same features for each house. Animal Pen Sawn Log Adds Tanning Rack. See this page for details on adding animals. Apiary 2 Sawn Log, Nails, 2 Straw Only available at Lakeview Manor. See house page for details. Fish Hatchery 3 Quarried Stone, 3 Sawn Log, 4 Nails Only available at Windstad Manor. See house page for details. Mill 2 Quarried Stone, 2 Sawn Log, 2 Iron Fittings Only available at Heljarchen Hall. See house page for details. Appears as "Grain Mill" and can be used to make Sack of Flour. Garden Sawn Log 11 Plots. Information on what can be planted can be found here. Smelter 2 Iron Fittings, 5 Iron Ingots, 6 Clay, 4 Quarried Stone Also adds Anvil at Windstad Manor. Stable 3 Sawn Log, 5 Nails Windstad Manor version includes one barrel for storage. You must build a stable before your steward can buy you a horse. If you wish to expand your home past the Small House layout, you can do so by choosing the Main Hall plan at the drafting table, then constructing parts at the carpenter's workbench. The Main Hall is considered complete after steps 1-6 in the table, but you can expand further by adding a cellar. After building the Main Hall, you have the option to remodel the Small House layout portion of the house into an Entryway if you choose. The Main Hall consists of two floors, with a firepit on the first floor, bedrooms on the second floor, and options to furnish the inside with an alchemy lab, an anvil, and an arcane enchanter. Clears anything already furnished inside. Adds different furnishing options (see this page for details). After completing the Main Hall (no cellar required), you have the option of building up to three additions to your home: the East Wing, North Wing, and West Wing. Each wing has three style options: a two-level tower with access to a small rooftop balcony, a single-level interior with a large rooftop patio, and a high-ceilinged single-level interior space. You can choose one of three options for the East Wing of your home: the Armory, the Kitchen, or the Library. The Armory has a rooftop patio, the Kitchen is a single-level high-ceilinged room, and the Library is a tower. See individual pages for details on furnishing choices for each option. You can choose one of three options for the North Wing of your home: the Alchemy Laboratory, the Storage Room, or the Trophy Room. The Alchemy Laboratory is a tower, the Trophy Room is a single-level high-ceilinged room, and the Storage Room has a rooftop patio. See individual pages for details on furnishing choices for each option. You can choose one of three options for the West Wing of your home: the Bedrooms, the Enchanter's Tower, or the Greenhouse. The Bedrooms have a rooftop patio, while the Greenhouse is a high-ceilinged single-level addition. See individual pages for details on furnishing choices for each option. Note that you must construct all three wings on each of the three houses to get credit for this achievement. Building and fully furnishing a house requires a lot of supplies. In particular, you will need a large supply of iron. While you can construct the Small House and Main Hall layout with just 17.5 iron ingots, it will cost you an additional 139.5 ingots to fully furnish them, and building the additions will cost between 24 and 37.2 ingots to construct (depending on your choices), or up to a total of 80.7-143.5 ingots to construct fully furnished, for a grand total when all is said and done of 237.7-300.5 ingots. The Library, Trophy Room, and Enchanter's Tower are the least expensive additions to build and fully furnish, while the Armory, Storage Room, and Bedrooms are the most. Multiply these numbers by three if you plan to build all the houses, and you can see they can get quite high. This means that you should be stockpiling iron at every opportunity. Visit every blacksmith on a regular basis and buy out their entire supply of iron ore and ingots. Carry around a pickaxe at all times and mine every iron ore vein you see. Halted Stream Camp is a particularly good place to stock up. Try to avoid using the Transmute Mineral Ore spell too much - silver and gold are useful, but you'll never need nearly as much of these as you need iron. Also, don't waste your iron and corundum ore making steel ingots. You should be able to easily get enough steel from vendors, but iron (and to a lesser extent corundum) are needed in large quantities in home construction. However, keep in mind that all vendors refresh their inventory every 48 hours, and so the player can wait in Whiterun for example for two days and buy all iron ore from Eorlund Gray-Mane, Ulfberth War-Bear, and Adrianne Avenicci (be sure that Adrianne is outside, see the notes section for Warmaiden's). It's advised to finish building or furnishing each part at one time to avoid some unnecessary bugs. Building a house was originally developed as part of the Game Jam. 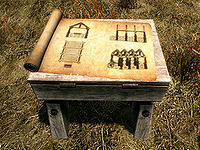 The menu for the exterior carpenter's workbench may be blank, even if there are items available. Exiting the menu and selecting the workbench again may fix this. If the problem persists, try this fix multiple times. 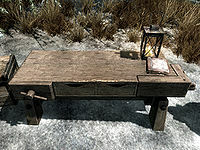 The carpenter's workbenches may have items that you already have built listed as being available. The railings on the deck of the Storage Room will not be removed properly and will block the path to connecting decks if it is built before the Bedrooms or Armory additions. Building the Storage Room addition last will fix this. Open the console, click on the blocking railing (ID = xx010E80) and type MarkForDelete. After reentering the area, only this railing will be gone and passing through to the other deck is possible. If you construct the Main Hall, and then partially construct one of the wings but do not complete it (the first-floor walls at least must be built), then you enter the house and leave via one of the doors into the partially built wing, you may find yourself "inside" the house but in the outside cell. You can usually reenter the Main Hall by the same door you left through, or in some cases you can jump through the walls to get out. Alternatively, you can fast travel anywhere (since you're technically "outside") if you're really stuck. Remodeling the Small House into an entryway will not carry over any improvements you have made, and anything you may have placed in the house's containers will be lost. This page was last modified on 20 May 2018, at 06:48.